One of our secrets to traveling is to pack a good beanie and scarf. They keep you warm, and easily double as an eye mask. The combination of the two is in our experience essential to staying warm on flights and not only falling asleep, but staying asleep given all the commotion on a longhaul flight. Here’s where Buff comes in. First, Buff offers what it calls “a multifunctional, tubular accessory,” we’ll call it a circle shaped scarf. In the few months that we’ve had it, we’ve fallen in love with it. Unlike traditional scarves it won’t fall off your neck. And you can easily roll it up to your face and just disappear. Moreover, it’s made out of merino wool, which is designed to wick moisture and keep you cool when hot, and warm when cold. While its not as soft as cashmere, its not scratchy either. There’s a video here to see how it can be worn in a variety of different ways. 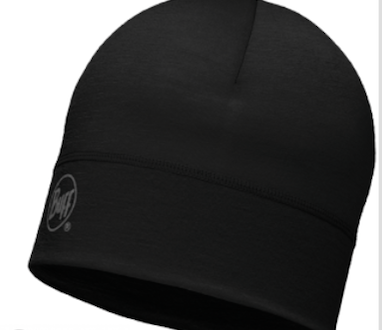 The beanie is also made out of merino wool and is also terrific. Both products are available in both a light weight merino wool - more appropriate for typical/daily use; and a mid-weight merino wool which would be more suitable for a proper cold day. The lightweight merino wool scarf and beanie haven’t left our travel bag since we got our hands on them.